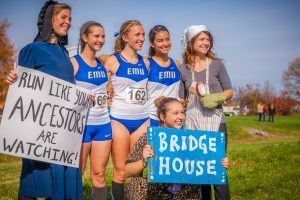 Eastern Mennonite University has a long history of students living in intentional community settings on campus — from cohabiting groups of the ‘70s to the current Theme Housing program, which began in 2015. The Shenandoah yearbook first mentions group-house living in 1971, when 53 women and seven cats were divided up among Martin House, Suter House and Birchwood. The following year, a student group named “Middle Earth” formed. 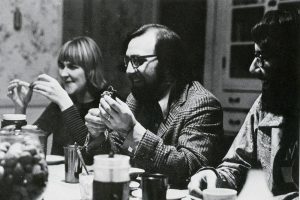 The 1973 yearbook indicates two intentional communities on campus — Arbor Vitae, a student group living with a faculty couple and Gemeinschaft, a conglomeration of married couples, children, and single students. Gemeinschaft’s intention was “the practice of observable love,” said Richard Showalter, an instructor of Biblical studies who lived in the house. Keith Gnagey ’76, now executive director of the Harrisonburg-Rockingham Free Clinic, lived in Martin House as part of an early faculty-student group. “It was wild! There was no night,” says Gnagey. In the 1975-76 academic year, nine students shared the house with two faculty families. “It was quite a commitment and quite an undertaking for faculty to move their families into this setting,” says Gnagey. He remembers staying up one evening until midnight studying, then deciding to bake bread – the smells of which wafted through the house at 4 a.m., “causing a major disturbance!” But generally, “good food and great conversations” made for a rewarding, if challenging, experience living in close quarters. One of the live-in families that year was Pat and Loren Swartzendruber, former EMU president, and then-infant Tim Swartzendruber, now associate director of development. “A few different EMU alumni say to me over the years that I was their ‘developmental psych kid,’ the child they were able to observe for their developmental psych course,” he jokes. Assistant Director of Housing Matthew Hunsberger also lived there as a student. “I had a wonderful experience living with a group of 13 students, and we’ve even had a few reunions over the years since then,” says Hunsberger. Hunsberger’s department is bringing back that vision of community with theme houses: students with common interests can propose to “live” these themes in an intentional community setting on campus. Currently, two houses – Eshet Chayil and Light House – promote student leadership and meditative spirituality, respectively. 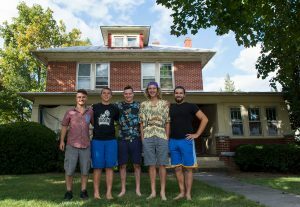 Theme houses are “an opportunity to have, primarily, senior students who want to stay on campus be engaged and give back to the community,” says Lead Residence Director Scott Eyre. He has seen in theme house residents “a desire to connect senior and upperclass students with incoming freshman.” These juniors and seniors have resources and camaraderie, developed over three years of campus involvement, to offer the underclassmen, explains Eyre. 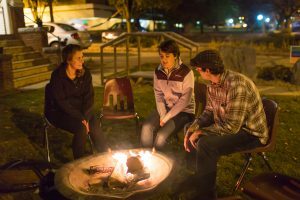 Each year, three on-campus houses are available for group living. The application process includes a mission statement, house goals, individual statements of interest, and a theme description including community impact. Potential themes could be oriented around academics, the arts, languages, sustainability, athletics, social issues, or peacebuilding, says Scott Eyre. The residents of the 2015-16 Bridge House (above) inspired the 2016-17 incarnation, called Eshet Chayil (Women of Valor). Eshet Chayil, meaning “woman of valor” in Hebrew, was first envisioned by senior Janaya Sachs, who shares the house with six other women. The phrase comes from A Year of Biblical Womanhood, by Rachel Held Evans, who visited campus in 2014. The house was also inspired by last year’s theme group in the same building, Bridge House. To follow in those footsteps, Eshet Chayil hosts parties, Bible studies, Eastern Mennonite Student Women’s Association meetings, and other events. Light House, a men’s residence, formed to provide students alternative, meditative spiritual experiences. They hoststructured discussions over a soup dinner on Thursday evenings and Quaker-style meetings on Sunday mornings. Thursday discussion topics have included neuroscience, sexuality in the Mennonite church, and a “restorative justice circle” after the presidential election. Sundays’ meetings are geared more towards introspection than dialogue — “an hour of quiet contemplation modeled after the Quaker tradition,” says house member Clay Cordell. “I thought it would be great to host a space where discussion and meditation were at the center of the experience,” said house member Samuel Saxton in an interview with the student newspaper, the Weather Vane. He and his four housemates wanted a different worship experience than what chapel offered.